Reality is veiled in filters and conveyed through symbols. 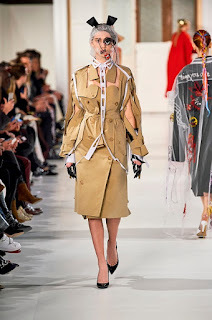 The communication of social media is the premise for the Maison Margiela SS2017 Artisanal collection in which creative director John Galliano resumes his ongoing study of global communities and interaction in a digital age. 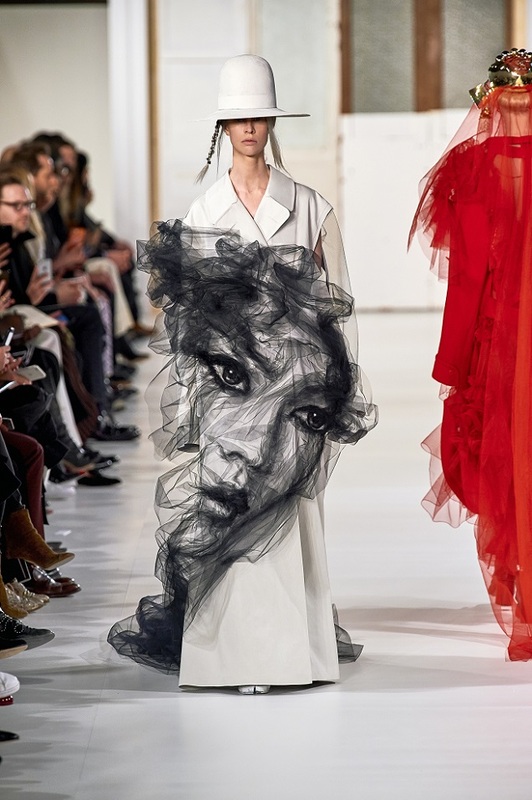 Drawing on the animated selfie filters found on social apps, garments are deconstructed and reconstructed through multiple layering until a final image comes to life. 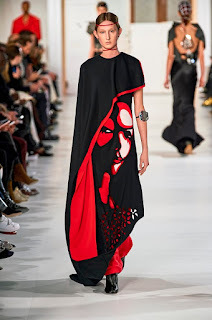 A face appears in the red and white cut-outs of a black jersey dress. The codes of Maison Margiela are intensified in volume and shape, transforming the house’s shirtdress into a billowing moving object. A décortiqué technique is introduced as pieces from the classic masculine wardrobe are reduced to expose their essential frames normally hidden from view. 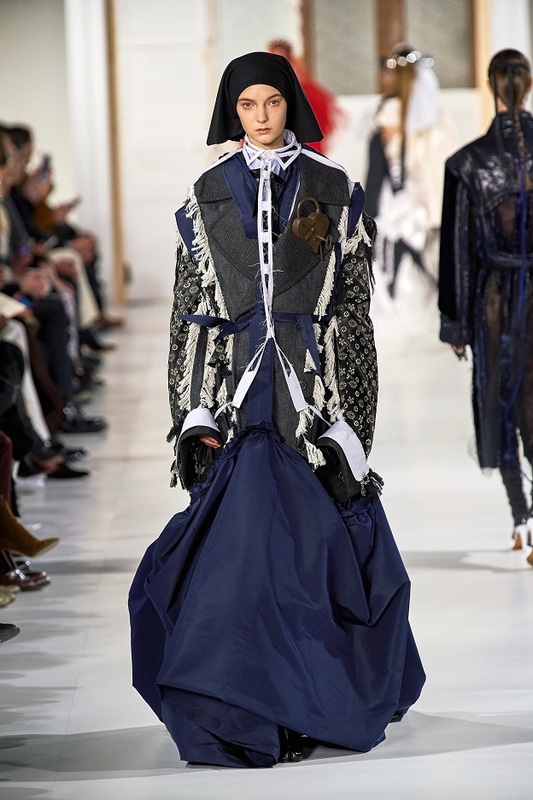 This reveals the essence of garments, embodied in a decorticated shirt worn with a trench coat, or in a look fusing the memories of a ball gown and a masculine coat. 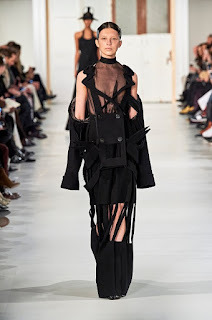 Unions between contrasting fabrics and colours create reconfigurations, a form of interface inherent to social media where combined images can replace the written word to form a language. This type of expression is exemplified in activist artwork taken from the Internet, which informs cutting and treatments throughout, and in the avatars and icons that inhabit the collection. A type of modern-day folklore, they emit tribal signals: symbols of belonging key to communication in cyberspace and beyond. 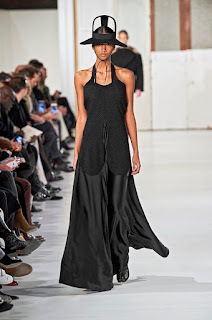 “This collection is about adding filters but as much about removing them. 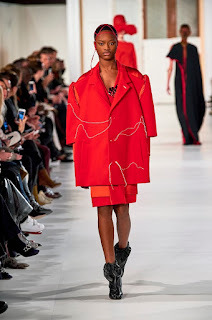 Sharing is about connecting with a community, becoming part of a union, and relating through mutual emotions rooted in memories,” comments Maison Margiela. Authentic menswear fabrics are used to evoke memories of classic garments. Twill, military wool and Melton wool – both heavy and light appear in coats and jackets, while tweed is used next to contrasting satin-back crêpe in dresses cut on the bias. Chevron and herringbone are found in jackets and shorts. Delicate cloths such as lace, broderie anglaise and embroidered tulle bring out the filtering effect central to the collection. Folkloric elements take centre stage: hopsack, crochet, stencilling, and check. 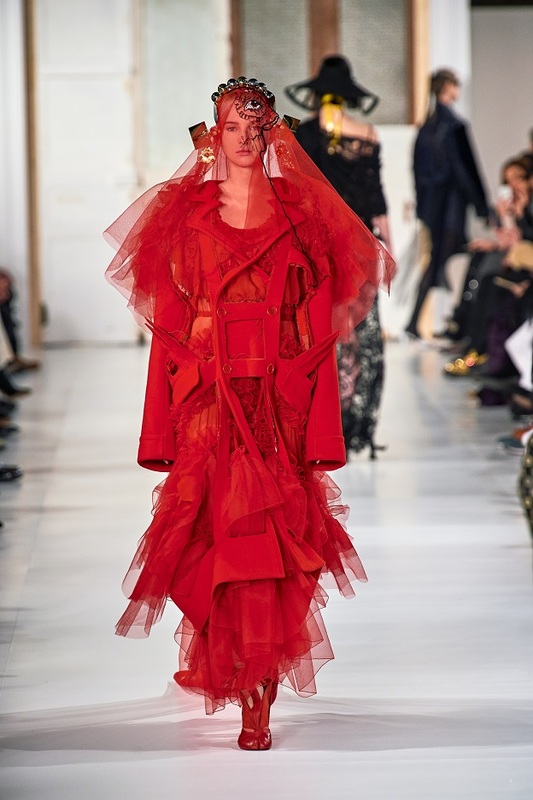 Opposing textures and surfaces come together to create new reactions, in polyamide, silk, satin, fil coupé, organza, taffeta, and velvet. 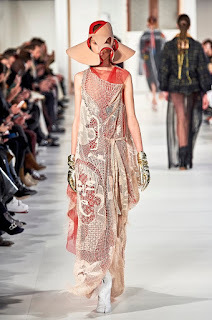 Lining in changeant, chiffon and interlining are revealed as layers are removed to create new images. 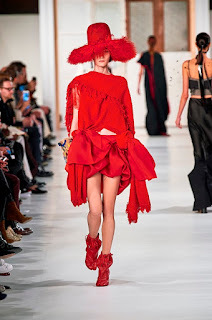 Décortiqué is the term John Galliano uses to describe the way layers are peeled off garments to expose their essential frames. 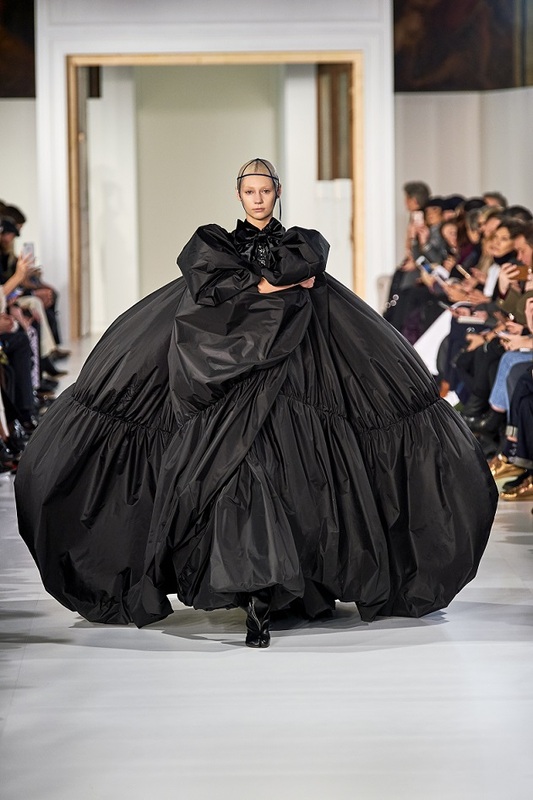 The technique lies at the heart of the collection, next to the filtrage layering of multiple fabrics like millefeuille, which builds up garments like social media filters. 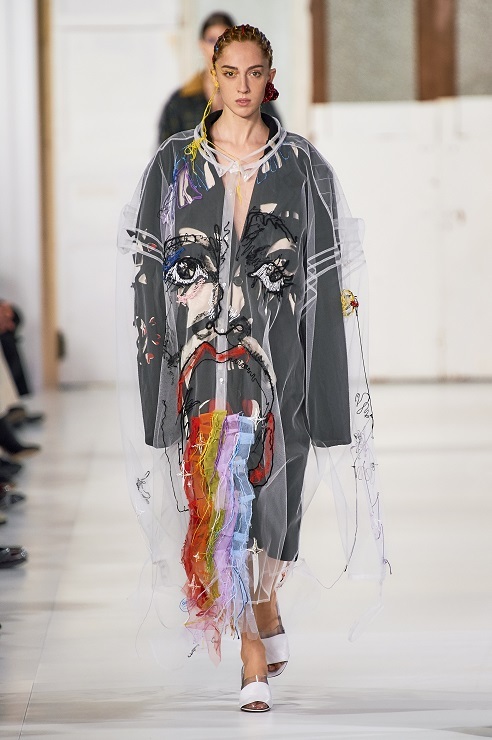 The idea is echoed in embroidery on top-layer transparent tulle pieces where images come to life on the backdrop of coloured garments, and in Maison Margiela’s collaboration with the artist Benjamin Shine. 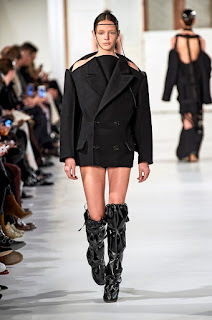 Here, the black tulle lining from a trench coat escapes, flowing around the body to reveal an intricately formed face hand-crafted to the coat by the artist himself, dissipating behind the form. 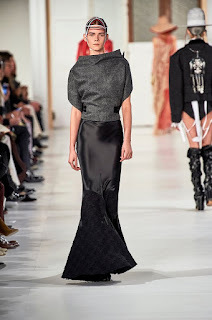 Contrasting materials are further unified, such as the fusion of satin and tweed in dresses cut on the bias. 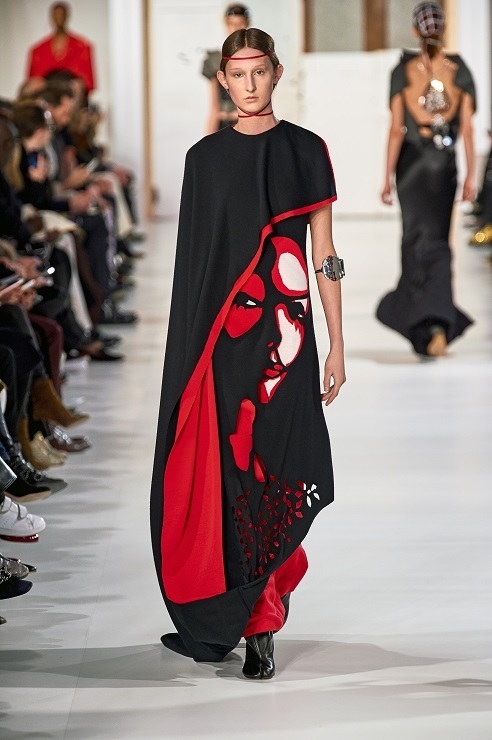 Colours native to military attire make up the collection’s palette of blacks, greys, reds and whites. 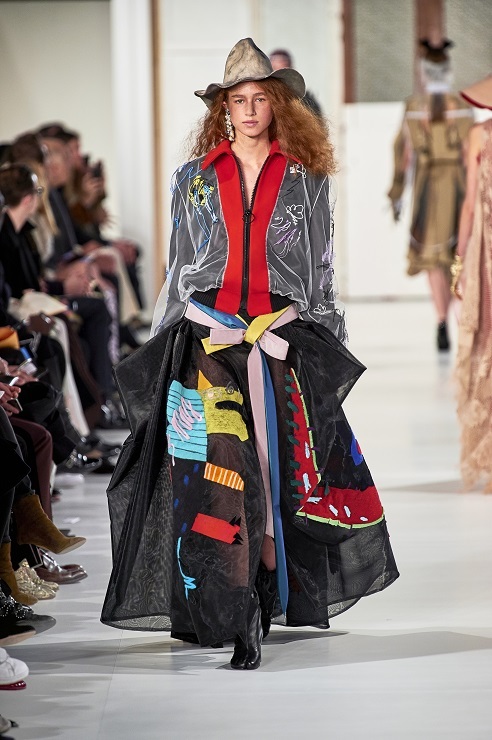 Embroideries introduce rainbow colours evoking the graphics of animated digital filters. High-polish chrome headpieces and large chrome necklaces worn on the back re-imagine traditional Dutch oorijzers, cementing the collection’s folk roots, while shattered heart pendants appear throughout. 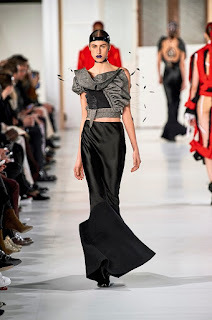 They are created in a union between crushed mirror, stones, safety pins, rings and embroideries.